I have a weakness for maraschino cherries. Whether they’re floating in a drink or nestled in cookies, I just want to pick them out and devour. Their candy-like sweetness, their shockingly bright color, and the fact they’ll stain your fingertips or clothes if you get cherry juice on them, and I’ve spilled a few drinks and have the stains to prove it, strangely lend to their appeal. They also have a tendency to get stuck between my teeth like a piece of lettuce. Except it’s red so it makes me look like I just got in a bar fight but I love them anyway. I think it’s because as a child a big treat was having a Shirley Temple at a restaurant on a special occasion. I’d covet and savor that lone cherry. Fast forward a couple decades, and I’d ask for extra of the extra cherries floating in my cocktails. Now I nibble on them in cookies. My grandma used to make fruit cake, sweet breads, and cookies with maraschino cherries and I remember them so fondly. The translucent magenta gems were like reflective beacons inviting me in to sit down and pull up a chair for a snack. I wish I had my grandma’s recipes for any of the things she made, but especially her cinnamon rolls and her cherry-filled goodies. I took some guesses at how she made her cookies for these. 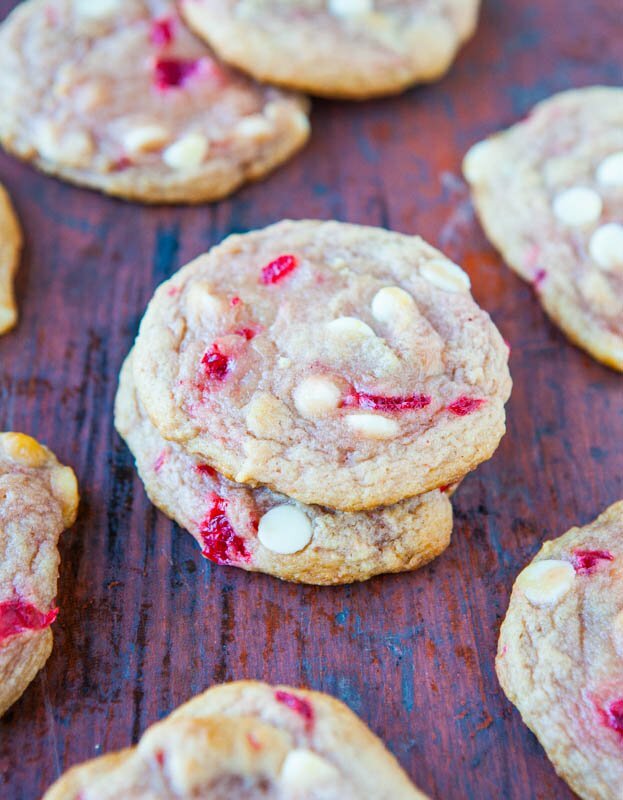 I used nearly the same cookie dough base that I used for the Cranberry and White Chocolate Chip Cookies, which were adapted from the Sugar-Doodle Vanilla Cookies. I prefer using that dough base for sweeter and more delicate cookies. 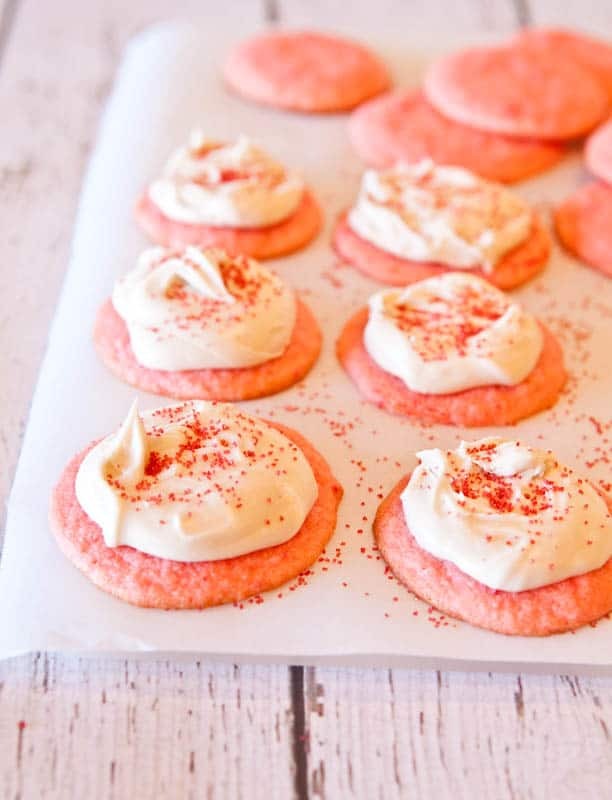 I use the Chocolate Chip and Chunk dough base for sturdier and heartier cookies like Brown Sugar Maple Cookies, but for something my grandma would have served with tea on pink plates with ironed, hand-embroidered, linen napkins, the Sugar-Doodle base is so moist, soft, chewy, and works beautifully. To make the cookies, cream together an egg, sugars, vanilla, cream and then incorporate the flour. I used one cup bread flour and three-quarters cup all-purpose. 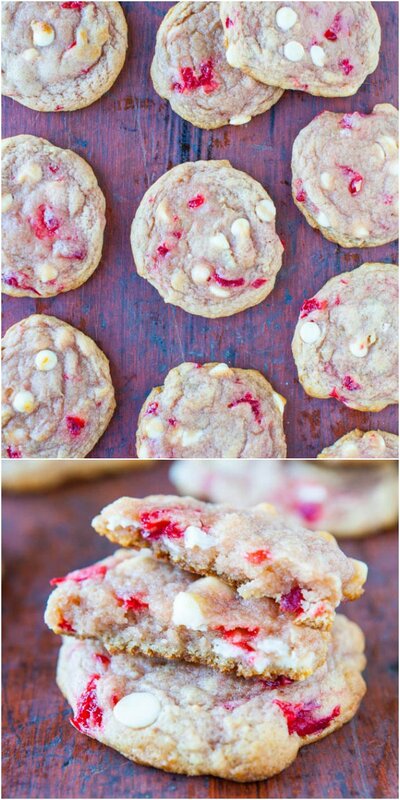 When I made both the Cranberry White Chocolate Cookies and the Sugar-Doodles, I used more all-purpose (1 cup) than bread (3/4 cup) but reversed the ratios here. I did that because I knew that adding the cherries would impart moisture and liquid to the batter and bread flour is more absorbent than all-purpose, and I wanted slightly more of it to soak up the juice. I recommend keeping a bag of bread flour around because you can use it plenty, and both bread and cookies rise better and are chewier when made with it, but if all you have is all-purpose, use it. However, you may need closer to two cups in order for your dough to come together because bread flour is a bit heavier and denser than all-purpose. Regardless of the type of flour used, this is a fairly tacky dough because of the cherries. Based on your climate, humidity levels, ingredients, and how the dough feels in your mixing bowl, adding up to two cups total of flour may be necessary in order for it to combine and not be too sticky. San Diego is dry and I never need more than one and three-quarters cup total, but conditions vary. 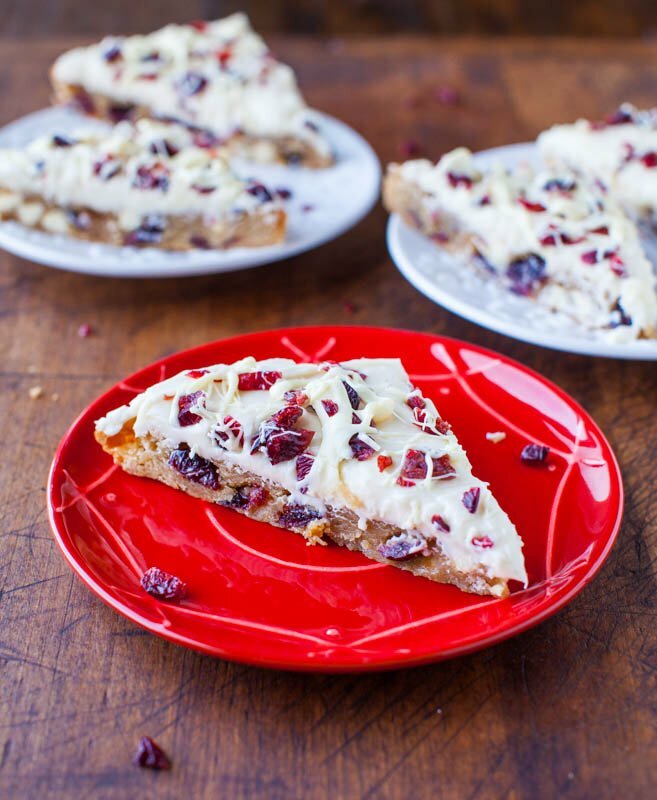 Fold in the chopped cherries and white chocolate chips. My grandma didn’t bake much with white chocolate because it was truly a delicacy in her era, but she loved it as I do. I know if she could have used it more she would have. This cookie dough base just begs for it and into the mixing bowl it went. Before adding the cherries, make sure they’re not dripping wet or they’ll water down the dough. You don’t have to dry them one-by-one, but after chopping them, lightly pat them on the cutting board with a paper towel. I’m sure you could use dried or fresh cherries, but either will lend a completely different flavor profile, and you’d have to experiment a bit. After adding the cherries and white chocolate, beat them in as gently and swiftly as possible so the cherries don’t break or have their color run too much. Using a medium cookie scoop, form 2.25-ounce mounds of dough, which is a scant quarter cup each. 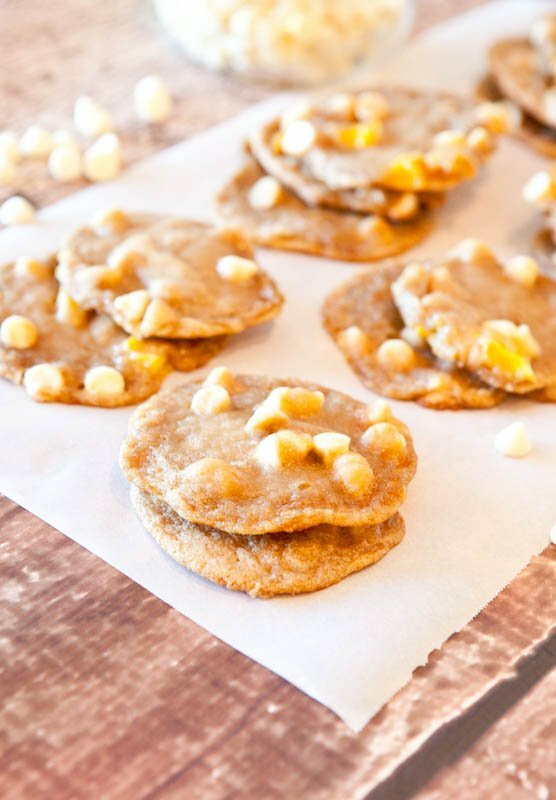 This recipe only makes a batch of about fourteen cookies and if you don’t have a scale, dividing the dough into approximately 14 equal-sized mounds is another strategy. The mounds will look somewhat large, but the dough is soft, light, and not heavy by volume. 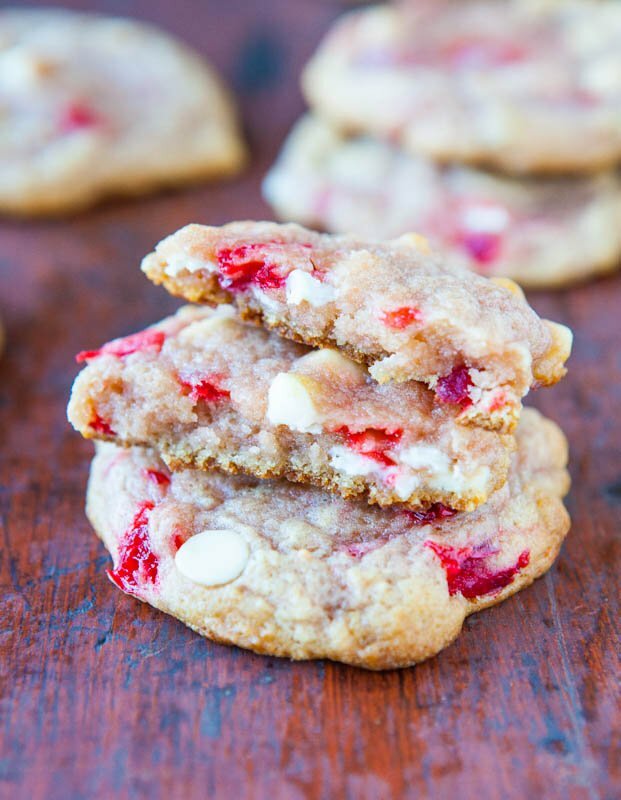 Plus the cherries and white chocolate really bulk it up, making the mounds appear large, but the resulting cookies are not big by any means; just average. The dough must be refrigerated before baking. The dough is too soft for immediate baking and if you attempt it, the cookies will spread into flat pancakes. Place the dough mounds on a large plate, cover it with plastic wrap, and refrigerate it for at least two hours, or up to five days, before baking. The nice thing about this dough, and most any cookie dough of mine, is that unbaked cookie dough or dough that’s been formed into balls can hang out in the refrigerator for many days before baking, or in the freezer for up to three months. When the time comes, reach into your Tupperware of dough balls or covered plate, and bake as many cookies as desired. Many nights before dinner I bake six so that we can each have two freshly baked cookies for dessert. My husband is not really a cookie guy. I don’t know how that’s possible, but he tends to go for things like scones, biscotti, muffins, or layered bars. However, he declared these cookies the best cookies I’ve ever made. 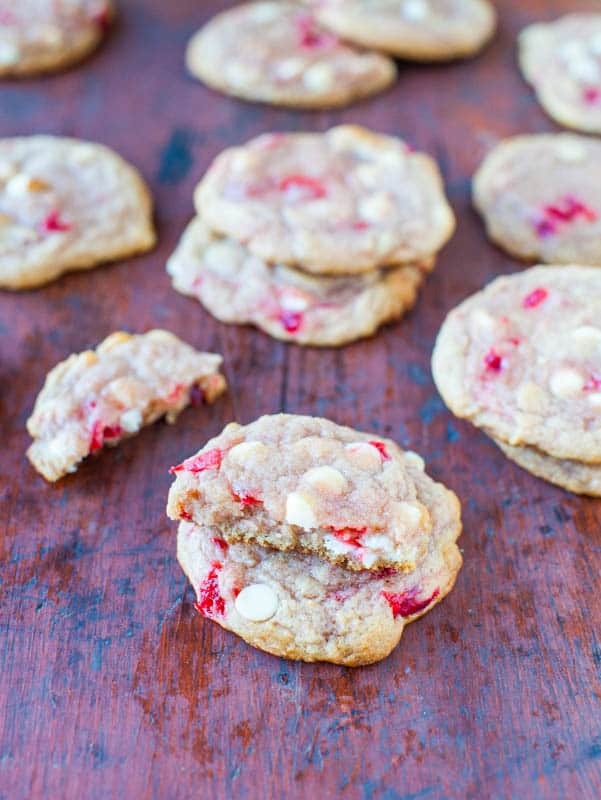 I loved the Cranberry and White Chocolate Chip Cookies and the Sugar-Doodle Vanilla Cookies and since they’re all versions on a theme, I knew I’d love these, too and I did. They’re so soft, moist and light, with tender centers and chewy-yet-delicate edges. They’re on the lighter side of the spectrum without being airy or cakey. The cherries add sweetness, texture, and the most incredible flavor. 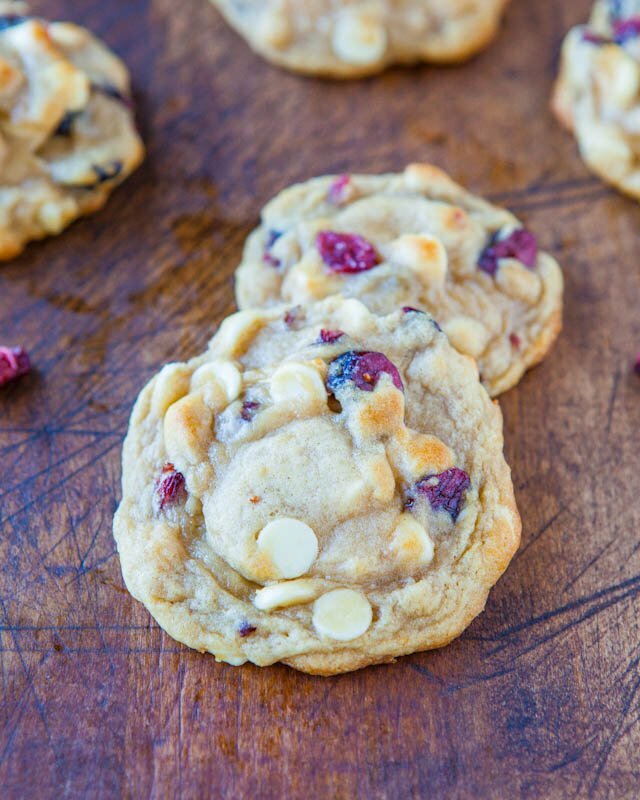 As the cookie dough rests and chills before and baking, the cherry essence seeps into the vanilla-scented dough and flavors it. 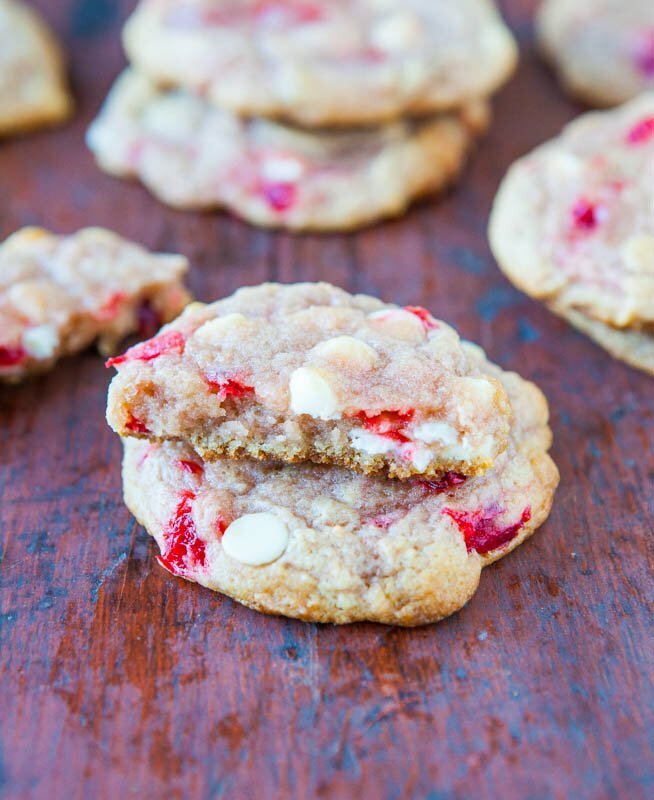 Between the abundance of chewy cherry bits and the white chocolate chips, there’s plenty of texture in every bite. They stayed soft and moist for a week in an airtight container. I only know this because I forgot about two that I had stashed and was pleasantly shocked to discover they were still soft and moist, a week later. I suspect the cherries helped facilitate that ever-lasting freshness. A perfect Valentine’s Day cookie. And a perfect excuse to eat copious amounts of maraschino cherries. 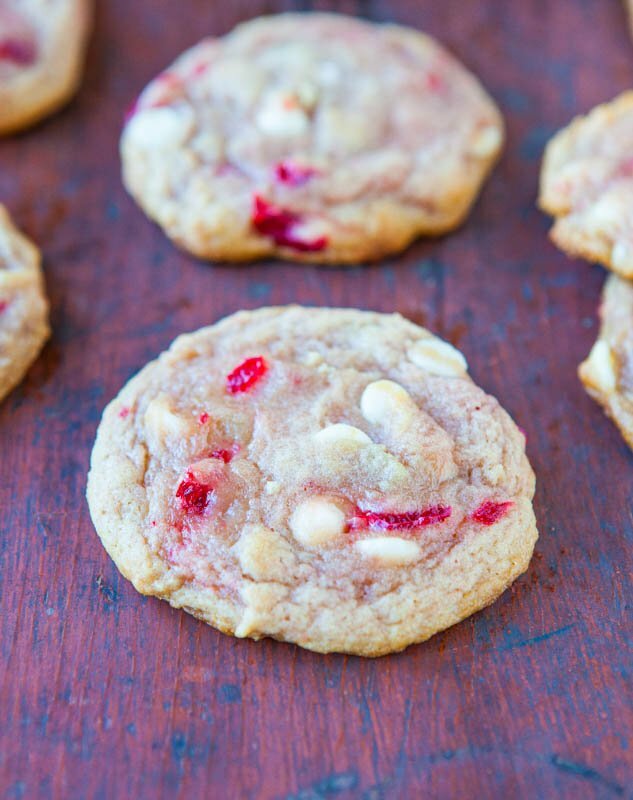 Maraschino cherries are the stars of the show in these very soft cookies with chewy edges and tender, soft, pillowy centers.The cherries add sweetness and their bright color is eye-catching. 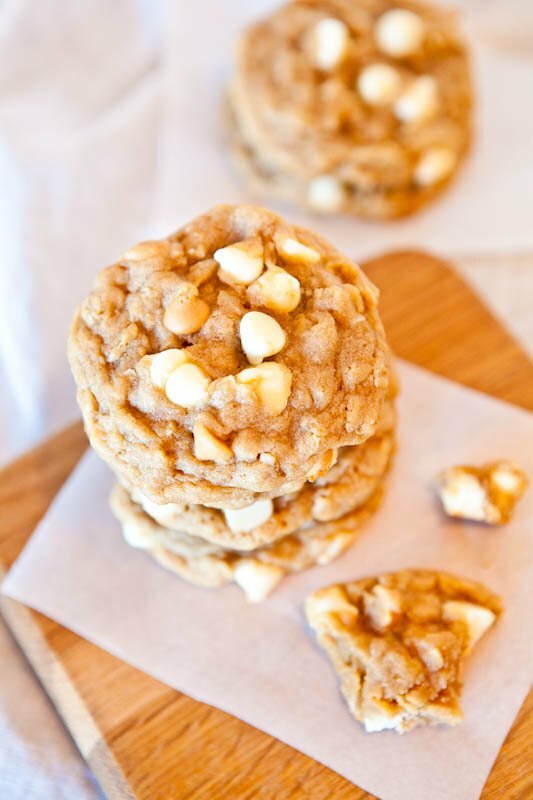 Coupled with an abundance of white chocolate in every bite, there's plenty of texture in these uber-moist cookies. 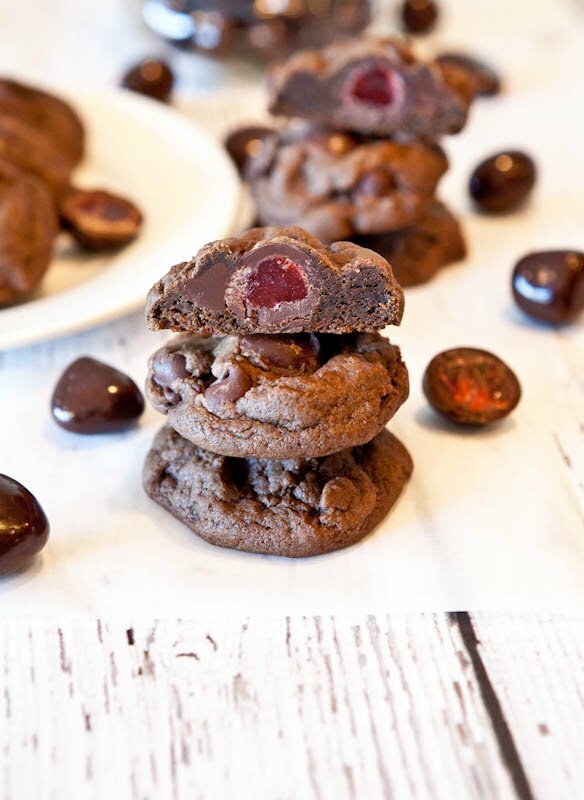 They're a perfect choice for Valentine's Day, Mother's Day, girlie birthdays, showers, or for anyone who loves cherries and melt-in-your-mouth cookies. To the bowl of a stand mixer fitted with the paddle attachment, beat the butter on low speed until smooth, 1 to 2 minutes. Add the sugars and beat on medium-high speed until creamed and well combined, 2 to 3 minutes. Stop, scrape down the sides of the bowl, and add the egg, cream, vanilla, and beat on medium-high speed until light and fluffy, about 3 minutes. Stop, scrape down the sides of the bowl, and add the flours, baking soda, salt, and mix until just combined, about 1 minute. Add the cherries, white chocolate chips, and beat momentarily with the mixer until combined or fold in by hand; don't overmix or the cherries will break. Notes regarding the flours - Solely using all-purpose flour will work, but the cookies will not be as chewy or rise as well because bread flour creates chewier results and gives greater rise. I live in a dry climate and only need 1¾ cups flour total but if you are in more humidity or your dough is very moist or loose, or are exclusively using all-purpose flour, adding up to ¼ cup of additional flour, for 2 cups total, is possible. The more flour, the more the cookies will stay domed and puffed while baking and the less likely they will be to spread. 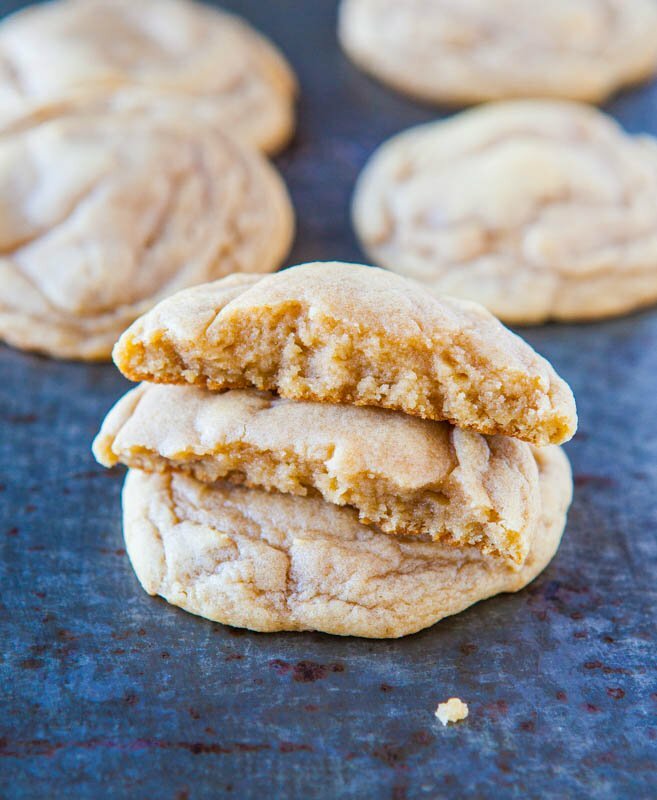 If you're uncertain, err on the side of more, and if the cookies are too puffy after baking, you can tap them with the back of a spoon a couple times as they cool on the baking sheets to flatten them. Regardless of using bread or all-purpose, this is a fairly sticky and tacky dough because of the cherries. Using a 2-ounce or medium cookie scoop, form heaping mounds weighing 2¼-ounces each, a scant ¼-cup measure; or divide dough into approximately 14 equal-sized pieces. Place dough mounds on a large plate, cover with plasticwrap, and refrigerate for at least 2 hours; up to 5 days. Do not bake these cookies with dough that has not been properly chilled because they will spread. Preheat oven to 350°F, line a baking sheet with a Silpat Non-Stick Baking Mat , parchment, or spray with cooking spray. Place dough on baking sheet, spaced at least 2 inches apart; I bake a maximum of 8 per sheet. 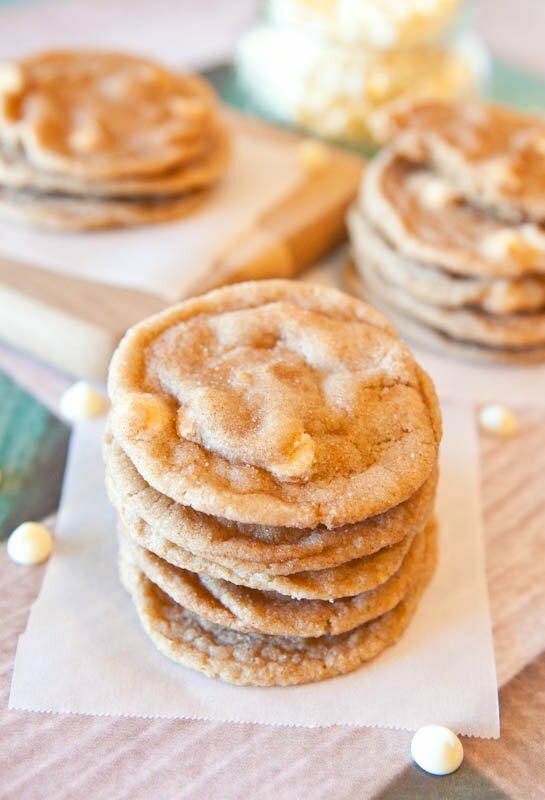 Bake for 8 to 10 minutes, or until tops have just set, even if slightly undercooked in the center, as cookies will firm up as they cool For crunchier cookies, extend baking time by 1 to 2 minutes. Allow cookies to cool on the baking sheet for 10 minutes before removing. Store cookies in an airtight container at room temperature for up to 5 days (I had success for 7 days), or in the freezer for up to 3 months. Alternatively, unbaked dough can be stored in an airtight container in the refrigerator for up to 5 days, or in the freezer for up to 3 months, so consider baking only as many cookies as desired and save the remaining dough to be baked in the future when desired. Do you like maraschino cherries? White chocolate? If you have favorite recipes feel free to share the links. 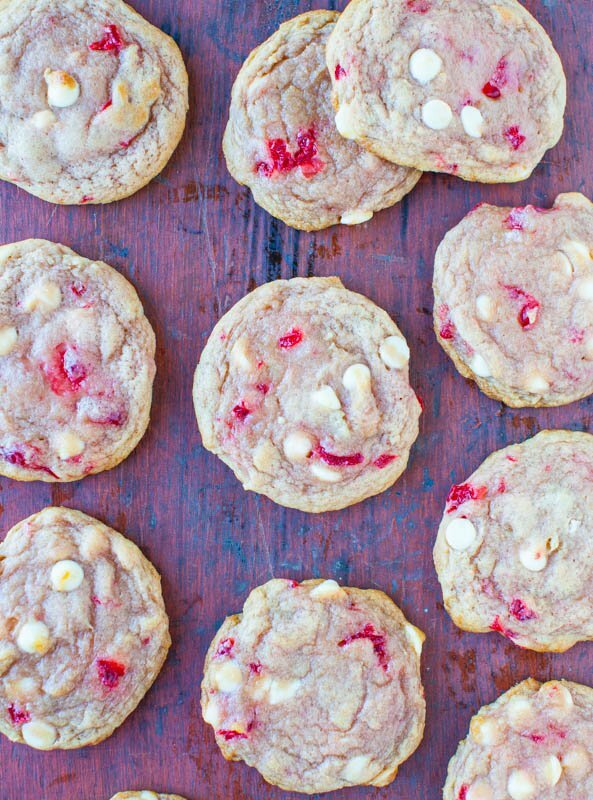 I love them both and have all my White Chocolate Recipes here including photos with links. 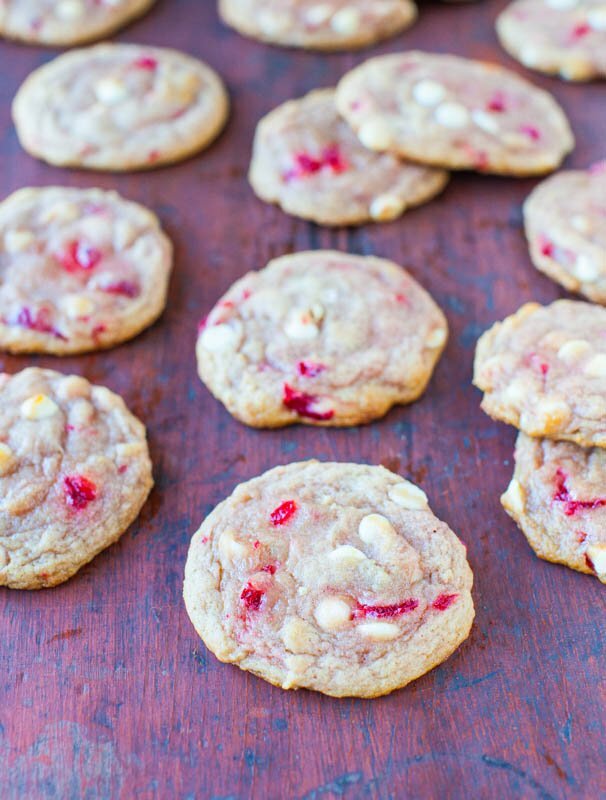 I made the maraschino cherry white chocolate cookies, holy cow……delicious. Chewy around the edges, soft on the inside. I only used all purpose flour, as that’s what I had. Yum yum. Thanks for the five star review and I’m glad you love the cookies!